Young adults are, in every generation, change agents of the most fluid parts of society - fashion, music, entertainment, relationships. Older generations resist change younger generations bring because they are comfortable with the established and the familiar, and often are not sure how to integrate the new with the old. Millennials have ushered in a new way of working that has transformed the traditional 9-5 cubicle position into something far more adaptable and mobile, leaving many Baby Boomers - and even some Gen-X-ers - unsure of how to relate to these young, innovative people who are joining the workforce. Everyone uses email to communicate for both business and personal items. The efficient, paperless and quick action that email offers is a far cry from inter-office memos and old-fashioned messengers and even snail mail. While email is still the top form of communication for businesses, many are also using texting, group messaging, Facebook chat and more to communicate with co-workers as more and more of our time is spent online. Millennials are native users of all things tech, so it is an obvious progression that the workplace will adapt to them and their modes of communication. As more and more Millennials launch businesses and lead companies, the entire feel and use of the workplace is changing. Collaborative and creative interaction among employees is encouraged, and traditional offices and desks are being swapped out for open spaces, extra long tables, and chairs, laptops and phones. The team vs. individual concept of working has created the need for more access to co-workers than a closed door or large desk offers. Not only is the way space is used changing, but the priority of what space offers is changing, too. Allowing for flexibility in use, finding ways to bring in natural light, making the environment comfortable and enjoyable and even offering free meals and gym access all contribute to a happier, healthier workplace. 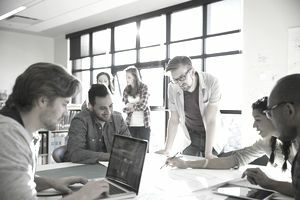 With all levels of employees, from assistants to presidents and CEOs sharing a workspace, everyone has the opportunity to participate in different stages of idea development. However, even with the open office trend, there is still a need for quiet space, and many companies are finding ways to ensure that, when needed, alone time is easy to arrange. We all know that everyone is available all the time, with cell phones constantly in our hands and computers on at all hours of the day and night. The question is, what are office hours? How are Millennials separating work time from off time? The answer is, in many cases, they aren't. Millennials are used to multitasking and stopping and starting things at the drop of a hat. One minute they can be hard at work on a group project, the next they can be taking a bike ride. Millennials do not want to have their success measured by how many hours they put in at the office but rather by how productive they are overall. Where their parents may view their jobs as something they go and do, Millennials often see their jobs as who they are and how they spend their time. The idea of working only during certain hours makes little sense to them since they are used to having access to everything in their lives online all the time. Parents of young adults may question their work habits and commitment to their careers when they observe them "slacking off" by going to the office late, taking frequent days off (flexible hours) and communicating in a seemingly haphazard way with co-workers and superiors via text message or other electronic modes of communication - but the reality is that their workplace and work habits are far different from what was customary years ago. Understanding these differences can help parents to grasp the nature of their young adult's career a little more easily.